The city that developed Ford's character has a long history of work ethic, moral demeanor, and sense of community. Founded on the banks of the Grand River in 1838, the small fur trading village quickly grew into the largest urban center in Western Michigan. 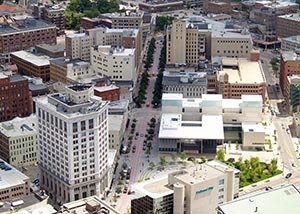 Today, Grand Rapids is the second largest city in the state of Michigan and is home to a diverse economy and a vibrant downtown. In Ford's day, however, the city had a different feel. Like many midwestern cities of the time, Grand Rapids thrived on industry, specifically the manufacture of furniture, warranting its nickname, "Furniture City." Browse the tabs on the left to learn more about Grand Rapids during Gerald Ford's youth. 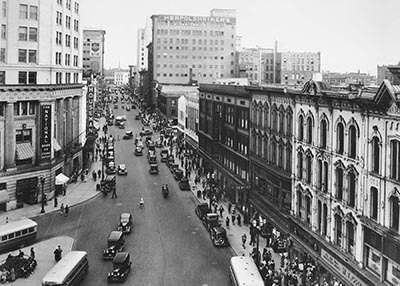 Monroe Center St, 1935 and today. Photos courtesy of the Grand Rapids Public Library.